Guess what I am late again with my monthly review! In fact thats the story of my life at the moment, I am struggling to get everything I want to do with the blog done. It was always going to be a struggle as I am not the sort of person that does something by halves, but thats the whole point there is only one of me. I am constantly checking myself to make sure that I am not neglecting the boys. Its so easy to get carried away with social media and writing and forget the reason I am doing it in the first place. I am trying to stick to the posting schedule which I covered in my January Blogging Review although I do find by the end of the week that I may not make a Friday post, yet a number of days I do post more than once. So the planner didn’t work for me and I have reverted to sticky notes on my laptop with my editorial calendar. I think this is partly due to my corporate work load I envisaged loads of thinking time in the car. Yet its so full on at work at the moment that I don’t have a spare minute. So I am reverting back to survival when it comes to writing! I know bullet journalling seems to help a lot of people so maybe thats something that may work for me. Giveaways Page – I have set up a new page for Blog Giveaways, as I am trying to run one a week and where possible two. I would really encourage you to ask when you are approached by brands as so many are happy to do a giveaway. If you are struggling with process then please check out my How to Run a Blog Giveaway post. My traffic is increasing and has gone up by 25% in the last month and I think thats down to running consistent giveaways. If you are running any then please feel free to link up my my page as the amount of traffic it gets is growing and so hopefully it will mean more traffic to your giveaway to. Of course if you could share the page among your blogging buddies that would be great too, the more the merrier I say. Mailing List – The big change is I have actually started to set up a mailing list…shock horror fall off my chair moment. How long have I been saying I am going to do this for? 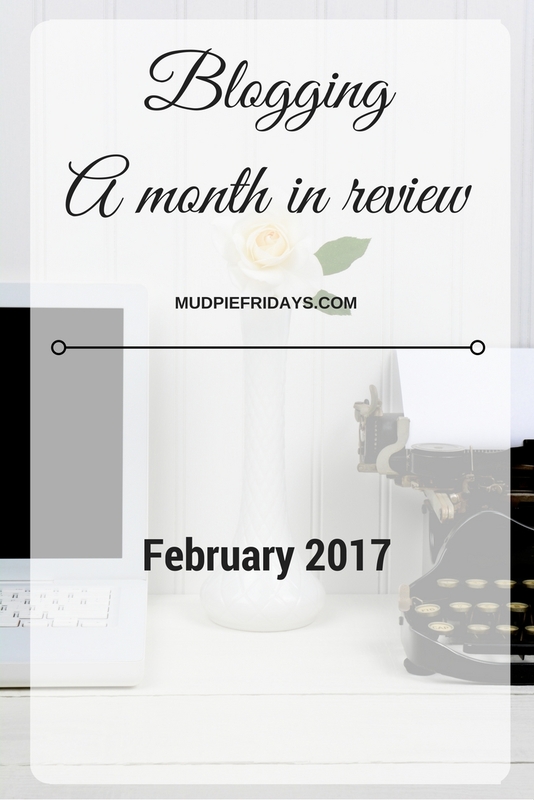 Its been partly driven by Mudpie Fridays turning two and the fact that I wanted to use the opportunity to grow my mailing list. Truth is I have been collecting email address via Sumo for some time but I haven’t been doing anything with them. I know some people hate pop ups but to be honest its amazing how quickly your odd subscriber here and there can add up. So if you don’t have the Sumo plugin I would encourage you to have a look at it. Just make sure you have turned the pop up box off for mobile sites. So far I have just under 700 subscribers, so not loads but a start. I am hoping to grow this over the course of 2017 and will be googling ways to do this. If you have any posts please feel free to link them in the comments below! I have decided to use Mailchimp at least in the short term. Of course now I need to actually write a newsletter! I am a little frustrated by the 300 odd old WordPress subscribers that I can’t do anything with, so if anyone knows a way of getting the data off of WordPress and into a mailing list please let me know. Theme Change – I suppose the bigger change is my theme! Like everything I do I decided to do this on the spur of the moment and I am loving it. I only wish I had done it ages ago when I went self hosted. I wrote all about how easy it was in my post Switching to a Pigdig Theme. If you are unsure do it! I really do think its helped my bounce rate too. Last month I wrote about trying to write a couple of pitches a week. I am not that great of keeping track of them to be honest although I have written a handful in Feb. Some of my others have come to fruition which is amazing… so watch this space. Of course there are those where I haven’t even received a no response. Being pretty thick skinned helps, at the end of the day it doesn’t matter if you don’t ask you don’t get so don’t let ‘no’ stop you. Events – well I have booked four blogging conferences… whoop. Not sure how I am going to break this fact to Hubby! So Blog On MSI in May and September, Britmums also in September and then also Break Through in Blogging which I happened to chance across while browsing Eventbrite. I did attend a fantastic event Mums Enterprise Roadshow in Brighton and will be keeping my eye out for their events planned for the rest of the year. Collaborations – This month I have worked on a couple of collaborations for kids theatre shows – Mr Blooms Nursery Tour and Ben & Holly’s Little Kingdom, we enjoyed a chocolate substitute with SuperTreats. Reviewed toys from Learning Resources, Hasbro and ran a Twitter Party and review for PJ Masks. We’ve tried clothing from Sainsbury’s and their new Elmer range and very cute leggings from Blade & Rose. Kipper has been loving a recent brand collaboration with Babaease and we have an exciting event coming up with them this month. We have also been contacted by Gurgle to appear in one of their articles on baby food. I am really hoping we made the cut and will be keeping my eyes open for the May/June edition. I don’t know about you but when the brands I know and love get in contact and ask me to work with it makes me realise how far Mudpie Fridays has come – one such collaboration was with Baby Bjorn. I am hoping that we will be able to enjoy more days out as the weather improves although we were very lucky to have visited Paultons Park during the half term. So its been a pretty busy month and March is shaping up to be the same. Yet again it is all about automation because I haven’t quite got there yet! Instagram – I am really looking forward to hearing about how I can develop and earn form Instagram when I attend BlogOn in May. The instagram hashtag #RememberingTheseDays which I run with Laura has now reached over 26,000. My strategy for Instagram has not changed. Twitter – I have been a bit lazy although I have my spreadsheets and uploaded them for February but March Ive been particularly rubbish. After each time I write a blog post I set up three tweets promoting it for the next three days. So thats nine tweets in total and if it is an evergreen post or something similar I will add it to my spreadsheet. Facebook – In the panic of getting ready to go back to work I am yet to even start the course that I signed up to…!! But I will get round to it and I have high hopes for finally being able to crack it… Ive not got anywhere with that either! Courses & Reads – I’m ignoring this one this month… (again). February Action Points – Review. Ermmm I still need to work on Aby’s Blog Accelerator Course … ooops. This month I want to give some serious consideration to looking at getting a virtual assistant. Well done to you on all of that. I really need to look into automation. Promoting my blog posts manually is getting really exhausting. You are killing it with that INSTA! I honestly don’t know how you are fitting it all in! I am in awe! I just discovered Sumo yesterday so looking forward to seeing how it works. oooo I’m going to the babease event this month too! the one next week? will lovely to meet a blogger in the flesh! Going back to work and maintaining the blog is so hard especially when you dont want to neglect the little ones. I think this is the best genre of blogs to be a bit wobbly with blogmin or posts as everyone appreciates that family comes first!